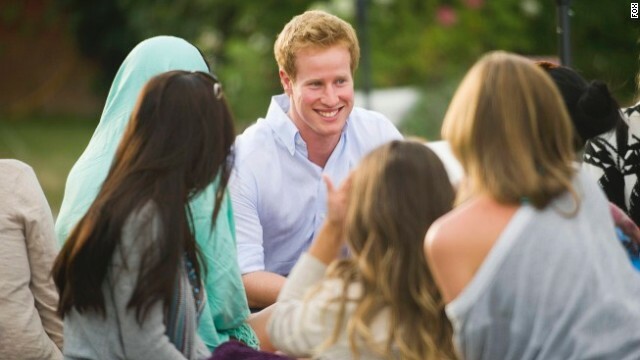 In Fox's new dating reality series, "I Wanna Marry Harry," which debuted Tuesday night, 12 American women compete to win the affections of a man they're led to believe is Prince Harry. Of course, the man they're vying for isn't the actual Prince Harry, son of Prince Charles and Princess Diana and fourth in line to the British throne. It's a fairly broke English guy named Matthew Hicks, who happens to look just similar enough to the real deal to be passed off as faux royalty. According to the BBC, 24-year-old Hicks is a cricket-playing environmental consultant who graduated from Southampton University and hails from Hertfordshire. Over the course of five weeks, Hicks takes a break from his regular life to try to convince his American suitors that he actually is Prince Harry, concealing the fact that he's "just a regular bloke from near London with no royal connections whatsoever," as he told The Hollywood Reporter. "It was quite ridiculous!" Hicks admitted to THR. "I did it because I thought it sounded like a lot of fun and would be an absolute laugh - what better way to meet a cool American girl?" The "deceiving and the lying" did start to wear on him after a while, he told TV Guide. "It was all a bit of fun, but after the process went on, that got a bit draining: the mental side of having to remember every single detail about Harry every time I opened my mouth to talk to the girls." On this side of the pond "I Wanna Marry Harry" has been blasted by critics, who have deemed it "Joe Millionaire" without "any real sense of shame" as it conforms "to every British stereotype of Americans." "Clearly," Variety observes, "the women are made to look foolish so the producers (and by extension, the viewers) can feel less guilty about goofing on them, coyly misleading them without ever actually uttering the name 'Harry.' ... The program relies on the women’s greed, enthusiasm and stupidity to sell the notion that most of them think the hunt for 'Prince Charming' is, in this case, more literal than usual." Did you catch "I Wanna Marry Harry's" premiere? What did you think?